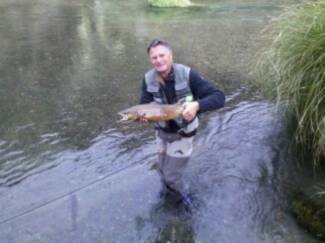 Taupo tributaries are hard going, you can get lucky and get into some fish but in general is tough. Best option is to get out of the Taupo tributaries and try more remote rivers,have been catching on big terrestrial dry fly. If you are not prepared to do this then the Lake is fishing well with good numbers and good conditiond fish. All methods are producing, ie harling/jigging/deep trolling.Black toby/baby brown being best colours. I managed to have a couple of days of and scoured myself a couple red deer for the xmas dinner. We often have clients stay and they always appreciate veni on the barby with a couple of beers !! Paul, Mark, Sue and Tony with some nice rainbows. Fishing is still fantastic on the rivers with some fresh fish about with the rain we have had. All fish have been caught on small naturals , completly ignoring glo bugs. Summer fishing technique is required, small indicator, 6lb line with a couple of small beadheads seems to work. Fish are rising on small mayflies so dry and dropper will also work. Lake Taupo continues to fish well altough patchy at times.Some very nice conditioned are being caught on all methods. Dark coloured lures seem to be best, black toby, baby brown working well. While trolling on the Lake we hooked someones line with a new rod and reel attached and nice trout on the other end! 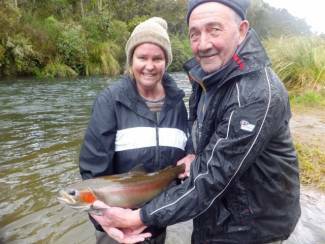 On the rivers the TT is holding good numbers of fish and the Tongariro continues to fish well. The Hini is getting hard as most fish have returned to the Lake and the ones still remaining are difficult to catch having been harrassed all season. 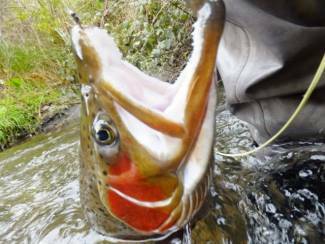 Backcountry rivers are fishing well with mixture of recovering and well conditioned fish. No dry fly action, need some long hot days, some decent weather would be a start ! Hope we didn\'t use up all of that last summer !! Lake Taupo's tributaries still offer some great sight fishing opportunities. The rivers are still loaded with spawning rainbows. It is nothing to see a dozen or so at a time in water less than a foot deep going about their business. You get really excited, put through the perfect drift only to be totally ignored! This sound familiar? Don't worry, happens to me as well, sometimes it is that the fish have had too much fishing pressure, they need a rest as well so may be better to move and find fish in less accessible parts of the river especially if conditions are low and clear. Don't go in with the mindset of just chucking glo bugs at them, a change to small naturals will often work. Good luck and tight lines. Guiding has been slow so i have been doing some fishing myself for a change and quite enjoying it. 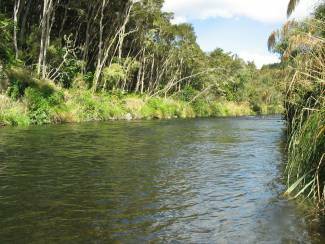 The rivers are full of fish and the Waitahanui has good numbers of Browns which can be sight fished in less than 1 foot of water which is great fun. They seem to like glo bugs, i tried small naturals but they showed no interest, back to the glo bug and "wham". I had 3 jacks jump clear of the water, (Browns are not big on airtime) one took off like a freight train and was all i could do not to bust him off. I found one small run which had 6 big fish in it as well as plenty of 2s and 3s scatterd through the river, you just have to find the ones which will show some interest. Great fun, had not been to the upper Waitahanui for quite some time so was nice to reaquaint mself with this magic river.